‘Left Behind‘ — a series of books billed as ‘evangelical Christian fiction’ written by Jerry Jenkins and Tim LaHaye — has been a huge publishing success. With the final book published in April, 2007, sales have reportedly totaled 65 million copies. Fiction or not, the series has come under heavy criticism from Christians concerned about its shoddy — and in places, un-Biblical — theology. , written by researcher David A. Reed addresses one of the central themes of “Left Behind”: the suggestion that unbelievers will get a 7-year “Second Chance” after the rapture. 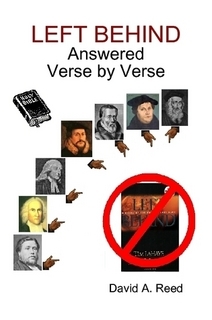 According to Reed, ‘Left Behind’ rejects the teaching of Martin Luther and John Calvin (leaders of the Protestant Reformation), Roger Williams (the first Baptist pastor in America), John Knox (early Scottish Presbyterian), Cotton Mather (a leader of Congregationalists in the American colonies), John Wesley (Methodist), John Wycliffe (Bible translator), John Huss (martyred by the Inquisition), and the 1646 Westminster Confession of Faith. Besides following the same format as my earlier books Jehovah’s Witnesses Answered Verse by Verse and Mormons Answered Verse by Verse (Baker Book House), the new book also features dozens of quotes from each of the pictured preachers and numerous other authorities, contrasting the teachings of Left Behind with the understanding held by scholars and Bible-readers for centuries. The main theme of the book takes issue with the seven-year-long “second chance” Left Behind offers to unbelievers and half-hearted churchgoers surprised by Christ’s return to rapture the Church. (One of the books in the Left Behind collection is actually titled Second Chance, and LaHaye repeats this thought in several of his fiction and non-fiction books.) Discussions of Jesus’ parables of the talents, the wheat and the tares, the wise and foolish virgins, the faithful and unfaithful slave and others, all demonstrate that Christ offered no such ‘second chance’ to those who fail to “keep on the watch” and find hence themselves surprised by His return. can be ordered from the publisher. The book is available in paper or download version.